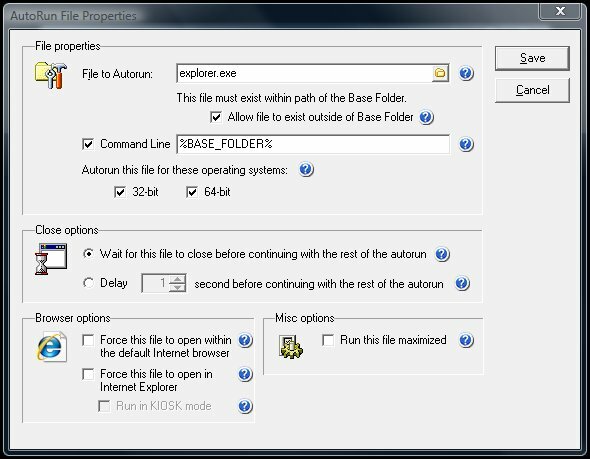 AutoRunWizard.com - AutoRun Wizard FAQ - What options can I choose for the Autorun File Properties command line? We have included several macros to give you certain folders when working on the AutoRun File Properties screen, specifically in the Command Line Options textbox. Note: These are case sensitive. Below is an example of using the %BASE_FOLDER% command line to open Windows Explorer to the root of the CD-ROM folder.